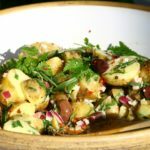 Serve this version of southern Germany's popular “Kartoffelsalat" warm or at room temperature with grilled meats or sausages, or hearty grilled tempeh. In a large pot, boil the potatoes in salted water 14–15 minutes, until just tender. Drain, and when cool enough to handle, cut the potatoes into 1/4-inch slices or 1-inch cubes and place into a mixing bowl. If using bacon, sauté the bacon in a large skillet for 4–5 minutes while the potatoes are cooking,, drain off most of the fat, and return the pan to the stove. Add the onions and sauté another 7–8 minutes. Add the stock, vinegar, and mustard and simmer for a few more minutes. For a vegetarian potato salad, sauté the onions in 1 tablespoon of vegetable oil for 7–8 minutes. Add the stock, vinegar, and mustard and simmer for a few more minutes. Toss the hot dressing with the sliced potatoes. Season with salt and pepper, and stir in the fresh parsley (and vegetarian bac’un bits for the meatless version) just before serving.